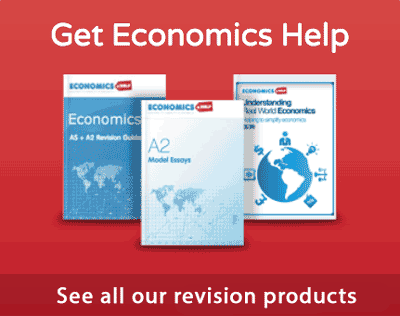 Readers Question: Could you give a summary of Keynesian and Classical views? 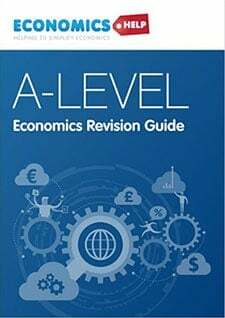 Classical economics emphasises the fact that free markets lead to an efficient outcome and are self-regulating. In macroeconomics, classical economics assumes the long run aggregate supply curve is inelastic; therefore any deviation from full employment will only be temporary. The Classical model stresses the importance of limiting government intervention and striving to keep markets free of potential barriers to their efficient operation. 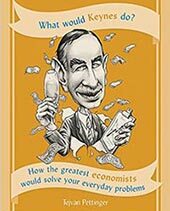 Keynesians argue that the economy can be below full capacity for a considerable time due to imperfect markets. 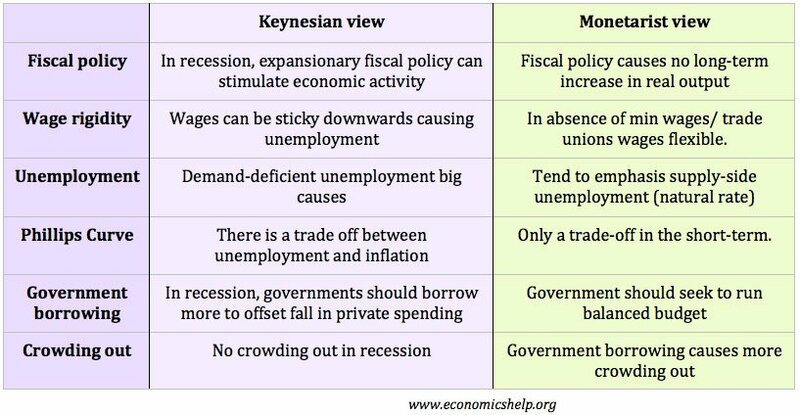 Keynesians place a greater role for expansionary fiscal policy (government intervention) to overcome recession. A distinction between the Keynesian and classical view of macroeconomics can be illustrated looking at the long run aggregate supply (LRAS). Negative multiplier effect. 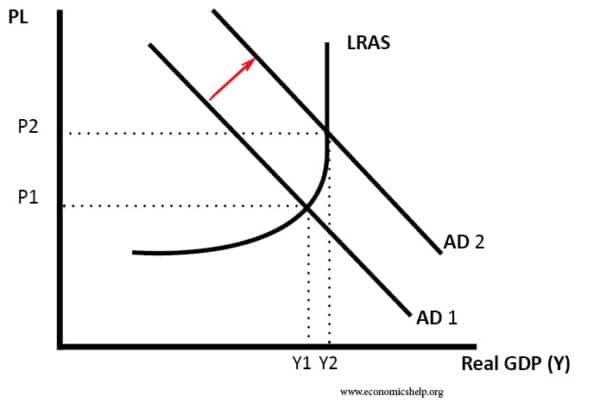 Once there is a fall in aggregate demand, this causes others to have less income and reduce their spending creating a negative knock-on effect. A paradox of thrift. In a recession, people lose confidence and therefore save more. By spending less this causes a further fall in demand. 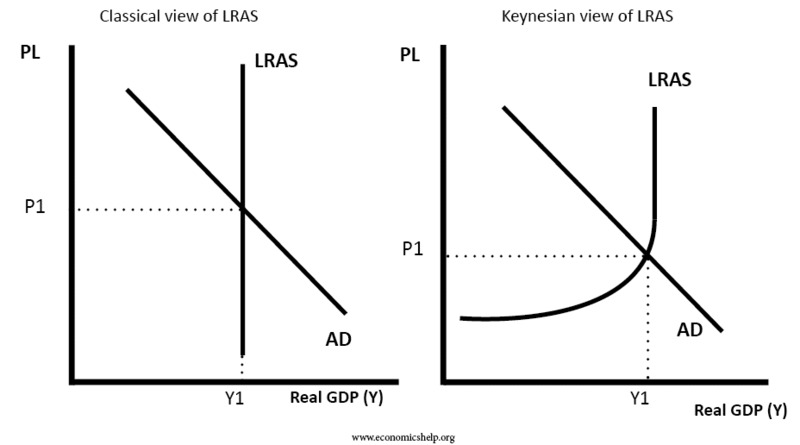 Keynesians argue greater emphasis on the role of aggregate demand in causing and overcoming a recession. 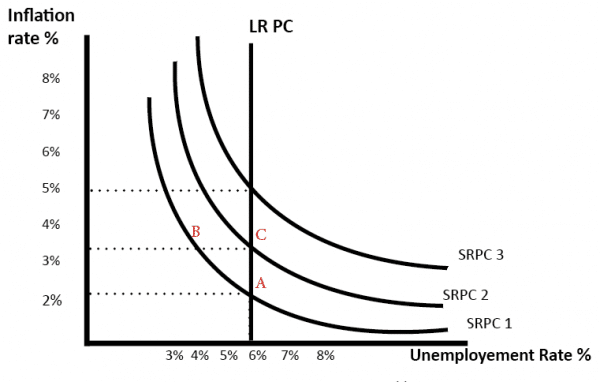 Classical economists argue that unemployment is caused by supply side factors – real wage unemployment, frictional unemployment and structural factors. 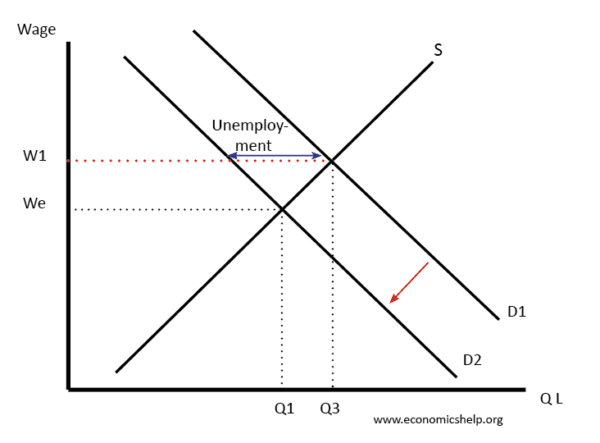 They downplay the role of demand deficient unemployment. 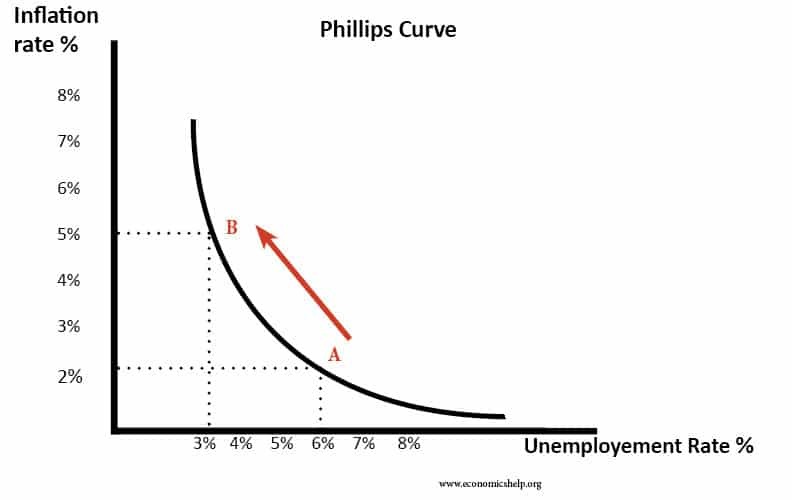 A classical view would reject the long-run trade-off between unemployment, suggested by the Phillips Curve. In a recession, increasing AD will lead to a fall in unemployment, though it may be at the cost of higher inflation rate. In the classical model, there is an assumption that prices and wages are flexible, and in the long-term markets will be efficient and clear. For example, suppose there was a fall in aggregate demand, in the classical model this fall in demand for labour would cause a fall in wages. This decline in wages would ensure that full employment was maintained and markets ‘clear’. However, Keynesians argue that in the real world, wages are often inflexible. In particular, wages are ‘sticky downwards’. Workers resist nominal wage cuts. For example, if there were a fall in demand for labour, trade unions would reject nominal wage cuts; therefore, in the Keynesian model, it is easier for labour markets to have disequilibrium.Wages would stay at W1, and unemployment would result. A Keynesian would argue in this situation the best solution is to increase aggregate demand. In a recession, if the government did force lower wages, this might be counter-productive because lower wages would lead to lower spending and a further fall in aggregate demand. Another difference behind the theories is different beliefs about the rationality of people. 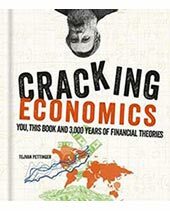 Keynesian economics suggests that in difficult times, the confidence of businessmen and consumers can collapse – causing a much larger fall in demand and investment. This fall in confidence can cause a rapid rise in saving and fall in investment, and it can last a long time – without some change in policy. The classical model is often termed ‘laissez-faire’ because there is little need for the government to intervene in managing the economy. Classical economics places little emphasis on the use of fiscal policy to manage aggregate demand. Classical theory is the basis for Monetarism, which only concentrates on managing the money supply, through monetary policy. Keynesian economics suggests governments need to use fiscal policy, especially in a recession. (This is an argument to reject austerity policies of the 2008-13 recession. A classical view will stress the importance of reducing government borrowing and balancing the budget because there is no benefit from higher government spending. Lower taxes will increase economic efficiency. (e.g. at the start of the 1930s, the ‘Treasury View‘ argued the UK needed to balance its budget by cutting unemployment benefits. The Keynesian view suggests that government borrowing may be necessary because it helps to increase overall aggregate demand. The classical view suggests the most important thing is enabling the free market to operate. This may involve reducing the power of trade unions to prevent wage inflexibility. 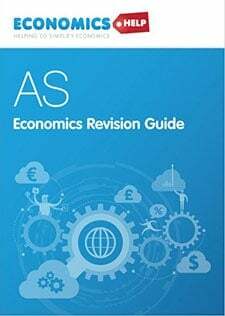 Classical economics is the parent of ‘supply side economics‘ – which emphasises the role of supply-side policies in promoting long-term economic growth. Keynesian don’t reject supply side policies. They just say they may not always be enough. e.g. in a deep recession, supply side policies can’t deal with the fundamental problem of a lack of demand. This is the best explanation I have seen on the net, thank you. Wow! I really enjoyed every detailed information in this site. It has given me an insight in what I am to expect in my exams. I love it cause of its simplicity in explanations. Keep it on i liked U published and the nature….am really greatful.